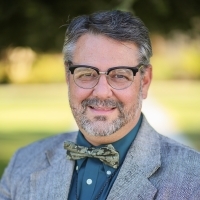 David W. Rogers, Minister of The First Christian Church (Disciples of Christ) has been pastoring here in Carlsbad since 2001. David is a graduate of Lexington Theological Seminary, with a Master's of Divinity. Originally from Albuquerque, NM, he has chosen to set down his roots here in Carlsbad. David is very involved in the Carlsbad Community and enjoys the opportunity to minister all those he comes in contact with. With is vibrant personality, his work is both inspiring and challenging.